"It's a really fun race with plenty of reaching and down wind that you can really let rip; the boat will be doing 20 knots and surfing for long periods," commented Pete Redmond. "Having said that, with all the corners and the amount of trimming required, it is the hardest and wettest 600-miler I have done by a long way. I have sailed with a lot of top 'pros' and they all do little things that make the boat go faster and that's what makes the difference. For my role as a trimmer and driver I need to focus to make sure I am doing everything I can to keep Tala going fast." "I am really the only old person aboard!" smiled Bernie Evan-Wong. "I look for young people who are willing to be team players, not rock stars. They need to be dependable, well-mannered and fun to be with, and have a good attitude towards learning. I can teach sailing skills, but the rest is beyond my control!" "It is important for me to learn as much as possible from more experienced crew; how they behave, react and work together and with the elements." says Elad Jaegermann who will be racing on Taz. "It is great to see how the theory turns in to practice and I collect as much as possible for my personal growth. I try to do my role the best that I can, and give all I have to the team so they will know they can count on me." Greg Williams (GBR) is just 18 years old and will be racing as part of his traineeship on Performance Yacht Racing's British Grand Soleil 43 Quokka 8. Supported by his parents, Greg took a job delivering milk to fund the investment for the course with the Cowes-based yacht racing school. "I think the most important thing for me is a willingness to listen to the skipper and to learn from what I am told," explained Greg Williams. "Everyone has to start somewhere, but the only way you can get better is by paying attention to the advice you're given and acting on it." Jorge Madden (ESP/USA) completed the 4,200nm Mini Transat in 2011 and will be racing his Marsaudon Composites 525 Level 3 Fun in the RORC Caribbean 600 multihull class. America's Cup sailor and Maxi world champion Carlo Castellano will also be on board. Level 3 Fun's crew include three young and passionate sailors training to become professional racers: Brian Reilly (USA), Alexander Lulewicz (POL) and Ben Fletcher (USA). "Our crew is a mix of young passionate athletes dreaming of becoming professional sailors who will race alongside expert coaches," commented Jorge Madden. "The great importance of young blood in a racing crew is their energy and stamina, especially in long distance races. Another good quality is being humble and good team members. Having a chance to do a big regatta with a good team is a privilege. Even if they are really talented and passionate, it's important to follow orders from the afterguard and be proactive by asking 'what can I do to help?' One of the most valued qualities to join Level 3 Fun is don't take yourself too seriously! Volvo Ocean Race sailor David Vera once said during trials: "You're mad as a hatter if you think I'm going to sail around the world without telling jokes!" Alexander 'Firefly' Lulewicz is racing on Jorge Madden's Level 3 Fun: "When you get the chance to sail with an exceptional team it can be truly magical." Alexander 'Firefly' Lulewicz commented: "When you get the chance to sail with an exceptional team it can be truly magical. There is no 'I' in the word team, and sailing is no exception. Everybody on the boat relies heavily on everyone else. Each member of the crew brings their own strengths and it's important to harness these to the team's advantage. When the gun for the start goes off, I know I am on a crew that I can trust and it is important for me to fulfil my role." 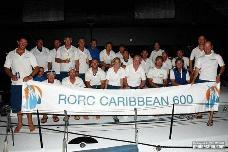 Burton, Hector and Bachmann's French Class40 BHB will be taking part in their second RORC Caribbean 600, having come second in last year's race with the same crew. Arthur Hubert (FRA) is the young sailor on board who project managed the build of the Verdier design. He raced solo in the 2018 Route du Rhum, coming 15th and has twice finished in the top ten of the Transat Jacques Vabre. One of the owner's, Louis Burton has competed in the Vendee Globe, three editions of the Transat Jacques Vabre and the Route du Rhum. Competing on BHB, the French Class40, Arthur Hubert says: "As a young sailor, I need to take these opportunities as it is a golden bridge to go on future adventures!" "It is Important to learn from experienced sailors, particularly on how to manage a race," commented Arthur Hubert. "The weather, the length and the competition are all important. Louis (Burton) has taught me a lot about taking care of the sails and of the boat. You don't need to push too much in order to be able to finish, but you need to push as much as possible to be on the top line! Moreover, you need to manage yourself; when to sleep, when and what to eat. In the team, I try to adopt a model role so that the owners bring me on many other experiences! As a young sailor, I need to take these opportunities as it is a golden bridge to go on future adventures!" concludes Hubert.